After another soggy Asian session, European markets have begun on a firm note, and US shares are trading broadly higher in Europe as well. Led by the beleaguered financial shares, and healthcare, the Dow Jones Stoxx 600 is up 2%. Similarly, the peripheral bonds, including Portugal (though not Greece) are seeing a reprieve from the recent selling. Spanish and Italian 10-year benchmark bonds are off 5-6 bp while the Portuguese yield is off 10 bp. The yield on JGBS, bunds, gilts and Treasuries are 2-5 bp firmer. The dollar is mixed. The dollar-bloc, sterling, and yen are firmer while the euro is a softer. Most emerging market currencies are firmer today. Oil prices have stabilized after yesterday's fall, perhaps helped by reports that Iran may be prepared to cooperate with Saudi Arabia. We are skeptical, as Iran is still playing catch-up with the lifting of sanctions not even two months old. US Department of Energy inventory figures due later today are expected to show a three mln barrel build after last week's report showing a nearly 7.8 mln barrel increase in stocks. US inventory build has been fairly steady if one removes the short-term noise. Over the past 26 weeks, the US crude inventories have risen by an average of 1.825 mln barrels a week (for a total of 47.45 mln barrels). Over the past 52 weeks, the inventory increase has averaged 1.724 mln barrels a week (for a total 89.65 mln barrels). The main focus today, outside of whether the capital market stabilize, is the Federal Reserve Chair's semi-annual testimony to Congress. Yellen's prepared remarks will be available at 8:30 ET and her testimony will begin at 10:00 am ET. She is wrestling with the conflicting forces as investors. As the Fed illustrated by not hiking rates last September, it takes financial market conditions serious when deciding on monetary policy. It may be more than officials at some other central banks like the ECB may do, but perhaps it is a function of the fact that capital markets themselves are more important and more developed in the US than in Europe. The FOMC statement issued at the end of January indicated that officials were watching how the market turmoil would impact the economy and their risk assessment, which in December was balanced. 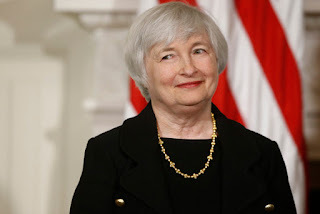 Yellen, like other Fed officials that have spoken, will likely suggest a position of watchful waiting. This will give the market little reason to increase its assessment of the odds of a March hike, which are placed at near zero presently. At the same time, Yellen, a notable labor economist in her own right, will take some comfort in the latest labor market data. Labor market slack continued to be absorbed in January, despite the market turmoil. Even if a small part of the increase in hourly earnings is due to the minimum wage increases, the internals as reflected in the JOLTS report is favorable, suggesting Yellen is not about to abandon the faith in the Phillips Curve. The JOLTS report, released yesterday showed two conditions that are consistent with greater wage pressure. First, job opening rose 3.8%, which is the strongest pace for the cycle and the strongest since 2000. Second, the "quits" increased and this is often associated with a sense of greater job security and higher pay. We also note that US auto sales were strong (stronger than expected) in January despite the wealth effect of slumping stocks. Yellen is also likely to express confidence that the US economy is not recession-bound, even though it nearly stagnated in Q4 15. The Atlanta Fed GDPNow tracker lifted its estimate for Q1 GDP to 2.5% from 2.2%. Germany reported disappointing industrial output figures yesterday, and the UK matched suit today. French industrial output fell 1.6% in December. The market was looking for a 0.3% rise. Manufacturing itself fell 0.8%. The consensus was for a 0.3% rise. The poor data was only partly blunted by the upward revision in the November series. Recall that manufacturing PMI rose to 51.4 in December from 50.6 in November. The survey data is running ahead of the actual performance. The UK industrial output fell 1.1% in December. The consensus was for a 0.1% decline. ONS had assumed a 0.2% decline for its GDP calculation. The unexpectedly sharp drop in December and the small downward revision in November (-0.8% from -0.7%) points to a downward revision to GDP. Electricity output fell 5.4% due to warmer weather. Manufacturing output fell 0.2%, after a revised 0.3% fall in November and a 0.4% fall in October. The manufacturing PMI average 52.7 in Q4 compared with 51.7 in Q3. Lastly, we note that Norway reported a larger than expected rise in CPI, which spurred a rally of the krone. The combination of the past weakness of the krone and higher inflation raises some doubt over an anticipated rate cut at the next Norges Bank meeting on March 17. The 0.6% increase in the headline CPI compared with flat expectations. The year-over-year pace rose to 3.0% from 2.3%. The underlying rate remained at 3.0%. The euro has closed at the upper end of this year’s range near NOK9.70 was poised back to NOK9.5760 before stabilizing. A convincing break of NOK9.58 can spur a move toward NOK9.50.